Gastown is a historic neighbourhood of Vancouver at the north east end of downtown Vancouver. It’s the citys oldest neighbourhood and is a dramatic contrast to the modern skyscape of downtown Vancouver. Its Victorian style buildings contain some of the coolest and trendiest places in Vancouver. Home to some high end shopping combined with tourist shops, it’s just a real cool place to hang out. 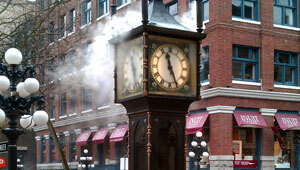 In the centre of Gastown is Raymond Saunders’ first steam clock. Built in 1977 as a new tourist attraction to boost a then newly refurbished Gastown local economy. The clock works by using a steam engine and electric motors, the clock displays the time on four faces and announces the quarter hours with a whistle chime that plays the Westminster Quarters. Nearby is Steamworks Brewing Co bar and restaurant, another good place to grab some drinks. It offers a wide variety of food and drink combined with some excellent service. Gastown was made a national historic site in 2009 and to walk around the neighbourhood is a real treat, the streets are lit extremely well with and it feel like an extremely safe place to be.